A New Map of Switzerland Divided into the Thirteen Cantons with their Allies and their Subjects. 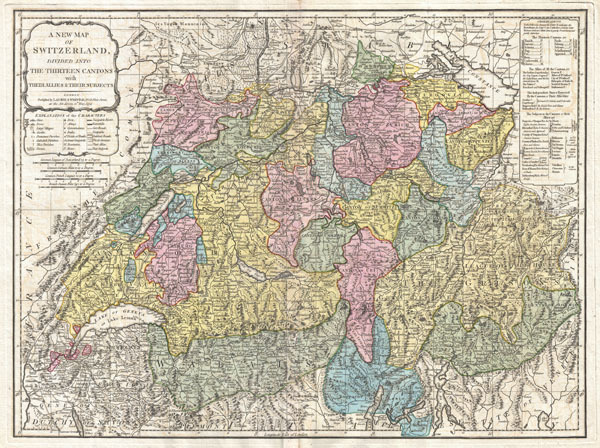 An extraordinary 1794 map of the Switzerland. Covers the entire country in extraordinary detail offering both topographical and political information. Color coded according to canton. With its unique blend of dramatic mountains and stunning vistas, Switzerland is considered to be one of the world's most beautiful places. A key and title cartouche appear in the upper left quadrant . Published by Laurie & Whittle for Kitchin's 1794 General Atlas. Rumsey 2310.036. OCLC 7160203. Phillips (Atlases), 4300, 6008-36-37. Bancroft Library G5200 1794.A5. Shirley, R., Maps in the atlases of the British Library, T.LAU-1c (1799 ed.). National Maritime Museum, 375 (3rd ed. 1801).